When I was a kid, I wanted to be an archeologist, at least during the time I wasn’t playing professional baseball. I had in my head an imagine of climbing over hidden, ancient temples and communicating with primitive natives, much like Indiana Jones. Prior to visiting Siem Reap, Cambodia, I had heard of a temple set in the jungle and largely unrestored. 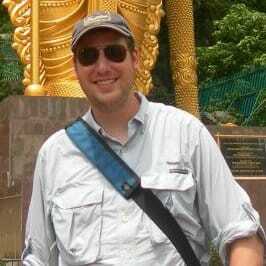 This discovery hightened my already keen excitement to visit the temples of Angkor. After spending three days looking at the temples of the Angkor Historical Park, my wife and I hired a taxi from our hotel and headed out at 6:30am for our day’s adventure at Beng Mealea Temple. 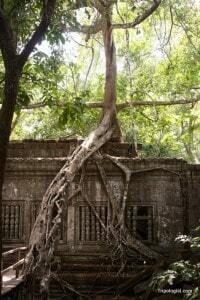 One of the many trees growing over the ruins at Beng Mealea Temple. 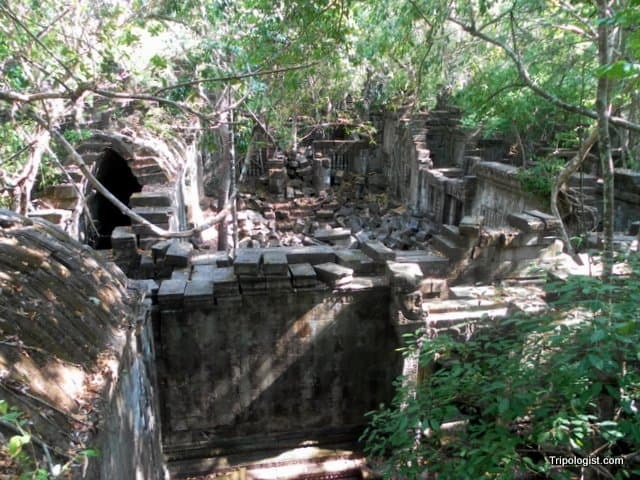 Beng Mealea was built in the early 12th century, prior to the temple of Angkor Wat. Made largely of sandstone, the temple’s Hindu carvings were quite intricate, and the temple was surely very impressive when it was completed. Like all of the temples of Angkor, it was lost to the jungle for several hundred years; however, unlike the temples at the Angkor Historical Park, Beng Mealea has been largely unrestored, leaving many large piles of rocks throughout that block off many of the temple’s rooms. When you arrive at the temple site, you will likely be greeted by a guide who will give you a 45-minute tour of the temple. This will generally involve a bit of climbing and scampering over rock piles. Once the tour is finished, the guide will expect a small tip, but he will then leave you alone in the temple complex if you ask. After having learned about the temple’s history, we were excited to see more. Following the wooden path that has been sat inside the temple, we soon came to a pile of rocks that we had yet to climb. Setting our inhibitions aside, we climbed the rocks, through a broken stone window, and up to the top of the gallery wall. Looking down, we were awe-struck by the temple around us. We climbed precariously around the temple for at least two hours, checking out the roofs of buildings, peering through holes in ceilings, and taking pictures. 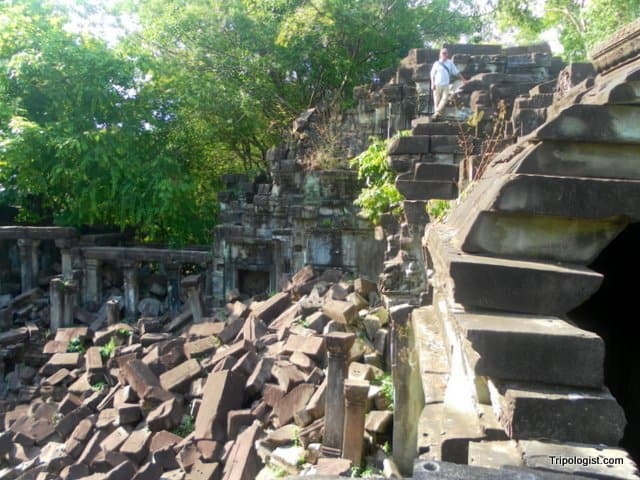 The Tripologist, top right, standing on a rooftop at Beng Mealea Temple. While we were climbing around the temple, we were joined by several local children who were playing around the temple; swinging from vines and quickly running over narrow precipices, it was a child’s dream and a parent’s worst nightmare rolled into one. If you find yourself in Siem Reap, Beng Mealea temple is not to be missed. It has recently been discovered by tour groups, and the bus loads are starting to come. If you want to enjoy the temple ruins without the crowds, make sure to get there sooner rather than later. In order to get to Beng Mealea Temple, you’ll need to rent a tuk tuk or a taxi. The ride will take between one and two hours. We rented a car and included a stop at the Koh Ker Temple complex, another hour and a half past Beng Mealea temple, for a cost of $70. The admission to Beng Mealea Temple is $5 and is not included in the ticket for Angkor Historical Park. If you do decide to stray from the wooden path and climb the temple ruins, you will get nothing more than friendly smiles from the workers and guides at the temple. Make sure to use caution however, as a fall from the top would be rather painful and you are far from a hospital. Also, try to avoid stepping on any of the carved stones laying around since you may damage the carvings. Hi, rent a car to Koh Ker and Beng Melea only $70, can you pls send the contact number of the driver or transportation company to me? Sorry, I don’t have the contact information for my driver. I organized it through my hotel, Okay Villa 1.